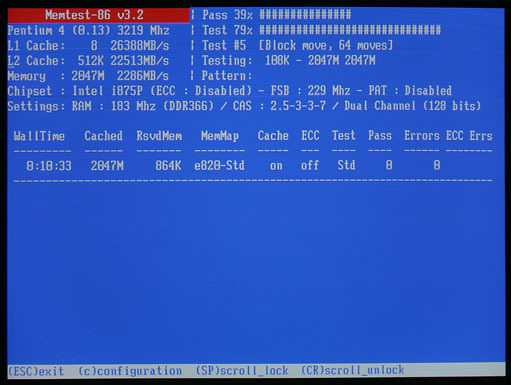 Memtest86 is a free program which tests the RAM on your motherboard. You can download the program from this site. In order to test your RAM more thoroughly, Memtest86 is not a Windows program. You create a bootable floppy or bootable CD-ROM which is then used to test your RAM without any operating system present. If you want to create a bootable floppy, then go here and get "Download - Pre-Compiled Memtest86 installable from Windows and DOS". That will give you a compressed .ZIP file. If you are running Windows XP, then right-click on the .ZIP file you downloaded and select "Extract All". Extract the files to a temporary directory. If you're not running Windows XP then you will need a .ZIP utility program like WinZip or WinRAR to extract the files. Open up the temporary directory and then double-click "install.bat". That will then prompt you to create the bootable floppy disk. To run Memtest86, just boot from the floppy. If you want to create a bootable CD-ROM, then go here and get "Download - Memtest86 ISO image (zip)". Then extract the .ZIP file as described above. That will give you an .ISO file. Run your CD burning program and then open the .ISO file and burn it to a disk. That will create a bootable CD-ROM which contains Memtest86. You may have to go into the BIOS and set the CD-ROM to be first in the boot order list for the computer to boot from the CD-ROM. Once you boot your Memtest86 floppy or CD-ROM, the memory test starts automatically. The test runs continuously until you exit. MemTest86 doesn't stop if it gets errors. It just writes the total number of errors on the screen under "Errors". If your RAM is working properly then you should be able to run the test overnight with zero errors.